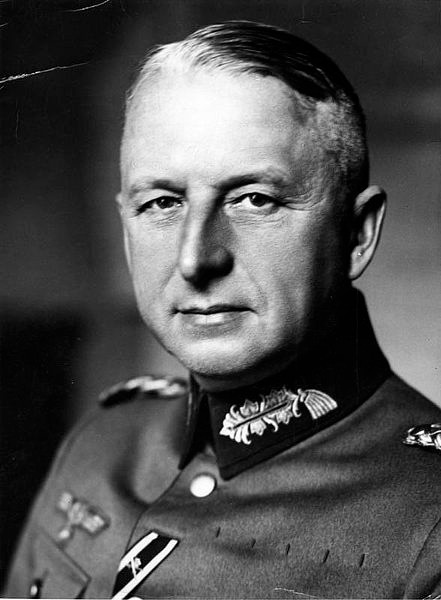 General Erich Von Manstein, Part 3. This unit was just a small piece of the jigsaw of Army Group North’s push through the Balkans during Operation Barbarossa, launched by Hitler on Sunday, 22nd June 1941. For the drive east, Operation Barbarossa, the subjugation of the Soviet Union, Manstein was put in command of a motorised corps, LVI AK (mot), assigned to Generaloberst Erich Hopner’s 4th Panzergruppe, part of Army Group North. He was assigned the 8th Panzer Division, 3rd Infantry Division (mot) and the 290th Infantry Division, a key problem being that one of his divisions would have to move by the age-old method of travel, by foot. He received his instructions from Hopner and, along with General Reinhardt, was ordered to punch through the thinly held Russian defences, then, encircling any units on their way, particularly the Soviet 6th Army, secure crossings over the Dvina River. In the early hours of the 22nd June 1941, Manstein struck at the army boundary between the Soviet 8th and 11th Armies, advancing over 40 miles in the first day. Although General Reinhardt’s XLI AK (mot) Corps, had been held up by a surprise attack from the Soviet 3rd Mechanised Corps around Raseiniai, Manstein continued his dash across Lithuania and made rapid progress down the Dvinsk highway. After an advance of nearly 200 hundred miles in less than 5 days, he secured the Dvinsk road and rail bridges across the River Dvina intact. The drawback to this speedy advance meant that Manstein’s forces were well ahead of the rest of Army Group North and his Infantry were still two days away. Along with that, his lack of experience in commanding armoured units meant his advanced units were practically immobilised through lack of supplies, particularly fuel. He had used up to 100 tons of gasoline per day. After an unsuccessful counterattack on Manstein’s bridgehead on the 28th June, by Soviet General-Major Lelyushenko’s 21st Mechanised Corps, Manstein’s Corps refuelled, the rest of Army Group North reached the Dvina River, and Manstein was again able to continue his advance, pursuing Lelyushenko’s retreat northeast, supported by the SS-Division ‘Totenkopf’, now attached to his Corps. Although his advance proved sluggish, Reinhardt having much more success in his drive for Leningrad, his Corps eventually marched northeast towards Novgorod with his 8th Panzer Division in the lead. In the meantime, Soviet General-Major Lazarev, gathered a force in the woods north of Soltsy, the 21st Tank Division and 70th Rifle Division, and three weaker rifle divisions south of Soltsy. On the morning of the 15th July he struck, mounting a pincer attack behind 8th Panzer Division in an attempt to cut them off from the rest of their Corps, the German panzer division was soon surrounded. Provided with limited supplies from the air, 8th Panzer Division was ordered to break out. After two days of fighting and incurring heavy casualties, they succeeded, but had to be withdrawn and switched to being a reserve unit while refitting. In early August, Manstein, reinforced by two Infantry divisions, conducted a frontal action against the Soviet defences around Luga. Just as he was on the verge of linking up with Reinhardt’s enveloping Panzers the Soviets counterattacked again. On the 12th August, the Soviet 11th and 34th Armies’ ten divisions attacked the three divisions of the German X AK, in Staraya, Russia. This was a major catastrophe for Army Group North. Manstein, on the 19th August, with his SS-Division ‘Totenkopf’ and 3rd Infantry Division, mounted a two-division pincer attack against Kachanov’s 34th Army to relieve the trapped Corps. Manstein not only re-established communication with the encircled Army Corps, but encircled the elements of five Soviet divisions capturing up to 12,000 prisoners. The Soviet High Command considered the defeat so serious; Kachanov was executed for his failure. ← The Fallschirmjager Glider Assault on Fort Eben Emael, May 1940. One of Germany’s top WW2 Generals.